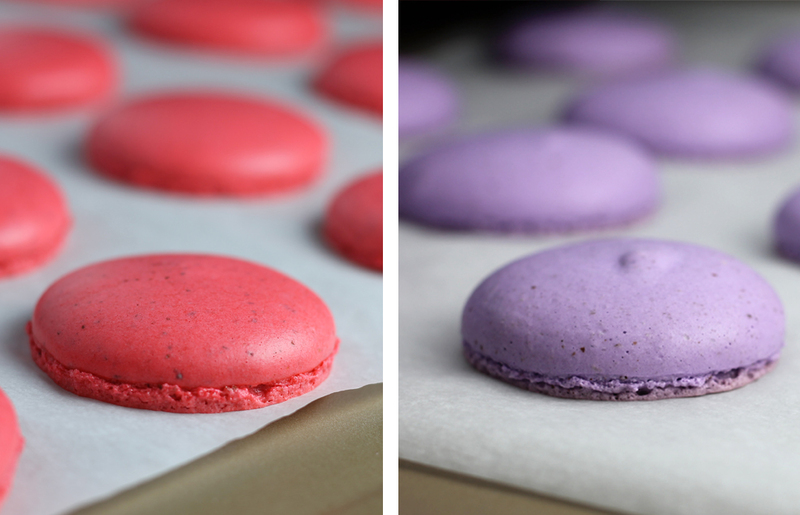 Once upon a time (last week) I made macarons for the first time and then made them twice more the same day. Sometimes I’m just weird like that, but this time it was because I totally screwed up the first try. Don’t worry, I’ll tell you why. So why did I make them for a second and then THIRD time? Well, the second batch was awesome and I had leftover filling so I made the third batch. The third batch also gave me an excuse to try a different cookie color. 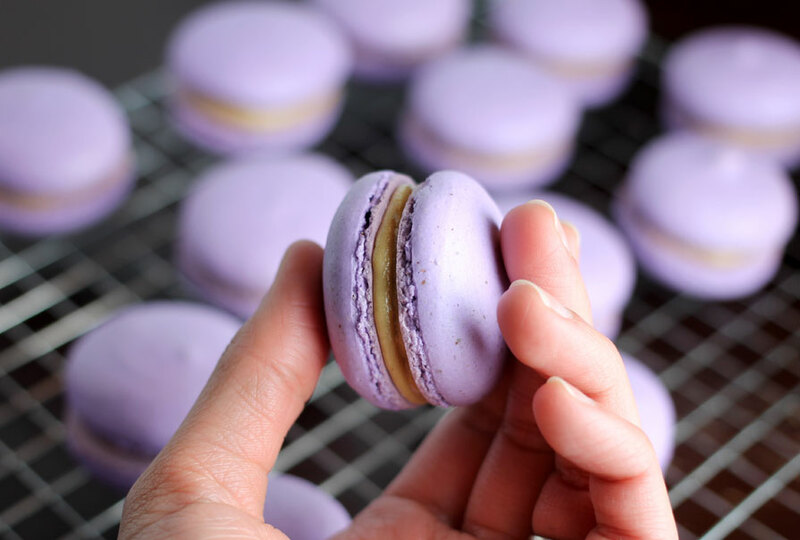 I had heard the horror stories about baking macarons, and if you look online, you can see the countless number of websites that are dedicated to tips for making the “perfect” macaron. It was almost enough to scare me away, but they’re just so damn cute I couldn’t resist at least trying. Plus, these things take five ingredients, so it wasn’t going to be a huge loss if they didn’t turn out. The key to non-lumpy macarons seems to be in the almond meal. I used store-bought finely ground almond meal and ground it for a minute in my mini food processor. When I make these again I will likely search out some almond flour that is even more pulverized from the start. In the almond meal I used you can also see the dark specks of the almond skin in there, which I might like to avoid in the future. It’s not a huuuuuge deal to see those little specks in there, but they are noticeable, even in the end. I don’t know why, but sifting is one of my least favorite things to do in baking. At any rate, I sifted the almond meal and powdered sugar together. Even thought it looked like the almond meal was ground as fine as can be, there were a surprising number of teeny tiny almond bits that got sifted out. Would I ever skip the sifting for these? Nope. The almond meal and powered sugar are set aside and then it’s time to whip up some egg whites. This is the step that resulted in my first batch not working out. The first time I made these I didn’t whip the egg whites enough. In the end, the batter was too thin and spread out too much. The second time I whipped the egg whites I made damn sure I got stiff peaks. I whipped these egg whites for 7-10 minutes. That’s a long time in handheld-mixer time, but it had to be done. Then I folded in the almond meal and powdered sugar into the whipped egg whites. I also added a big drop of gel food color at this point so that it would be mixed in at the same time. It looks kinda weird and chunky at first, but all of the ingredients really do eventually mix into a nice, smooth batter. I lined two baking sheets with parchment and piped on some 1 1/2 inch circles… or as close to that as I could get. They were let to hang out on the counter for 15 minutes while the oven preheated. 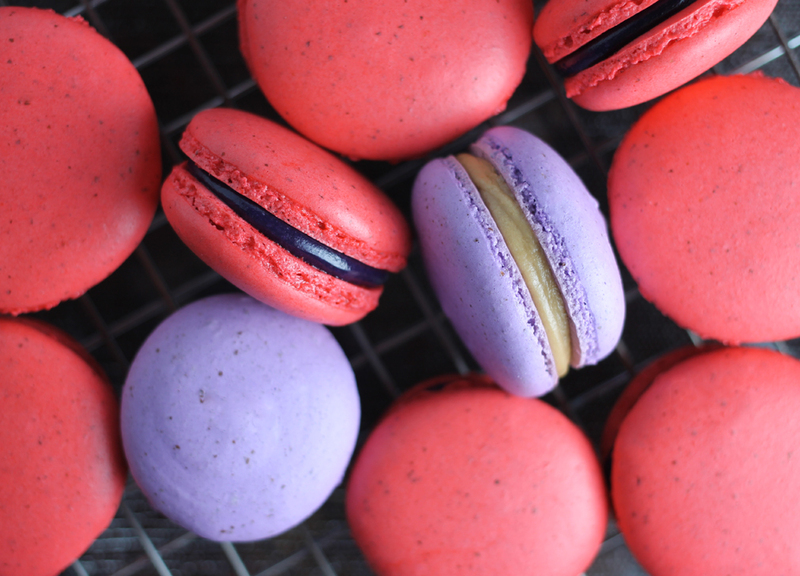 They should be left to sit out anyway so that the outside of the macarons begin to form a bit of a crust. The end result will be a delicate “shell” on the outside, and a soft and almost chewy inside. I made two entirely different batches to make two different colors. When the cookies were baked and totally cooled, I paired similar sizes together. 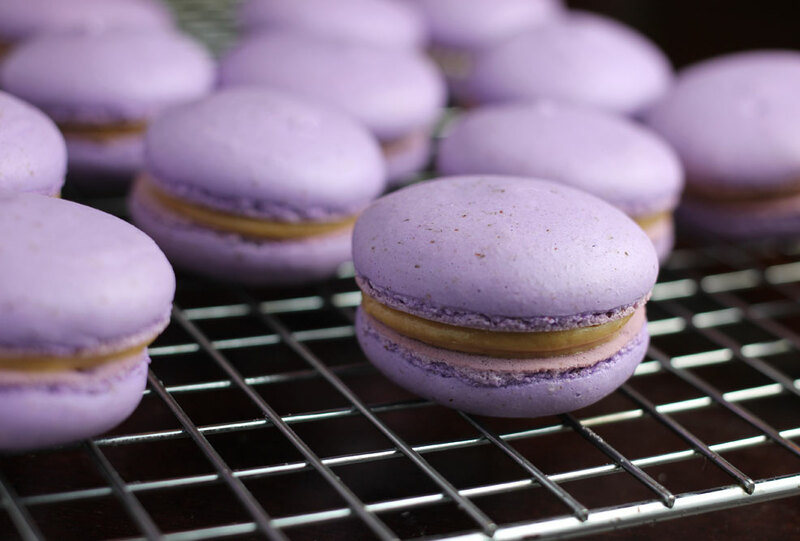 I have to admit that I also made macarons because I wanted an excuse to use cookie butter. If you’re not familiar with this, it has a slightly thicker consistency than peanut butter, but it’s made of cookies instead of peanuts. 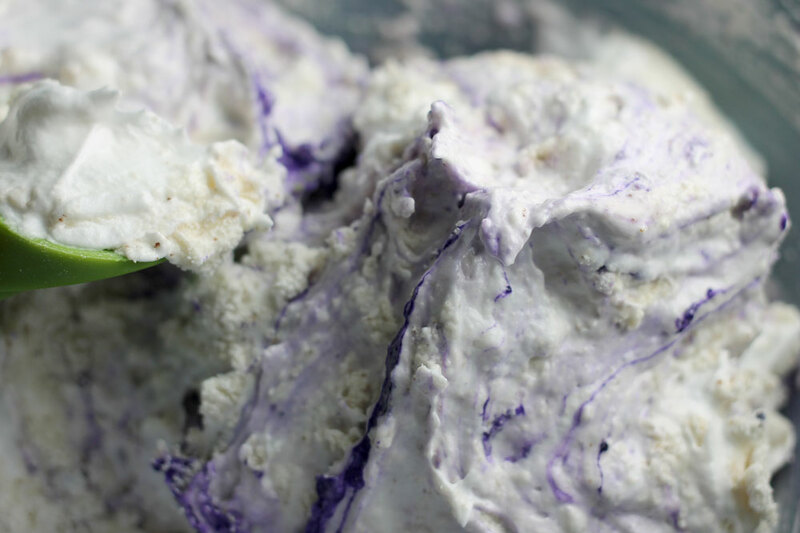 If you have a sweet tooth and like cookies, it’s pretty amazing by the heaping spoonful. You can use it straight out of the jar, but I wanted something a little lighter. I made a three ingredient filling with 1/2 cup of each: cookie butter, softened cream cheese and powdered sugar. 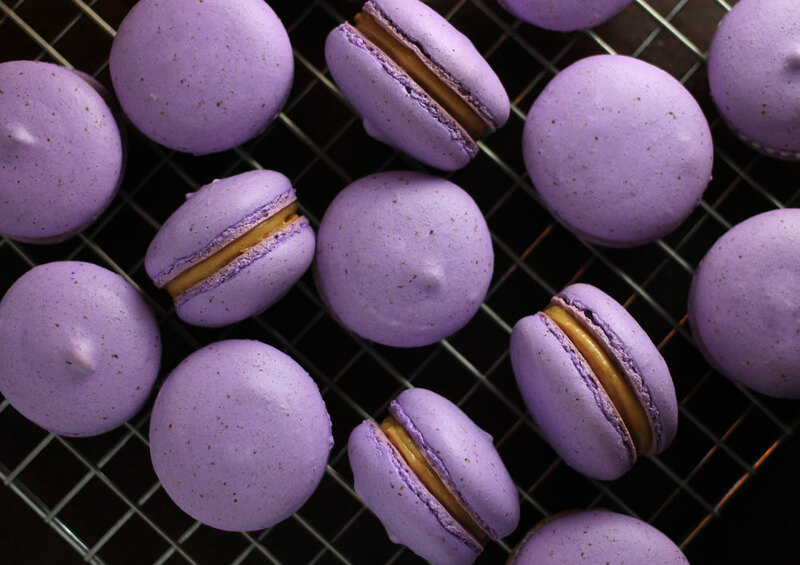 Are these macarons I made perfect? No. Hell, it was my first day ever making them! Are they good. YES. And best yet, they’re not at all scary to make. There is really nothing here to be intimidated about. My third batch turned out even better than the second which was leaps and bounds better than the first. It’s just going to get better from here! Preheat oven to 375 degrees and line two baking sheets with parchment paper. 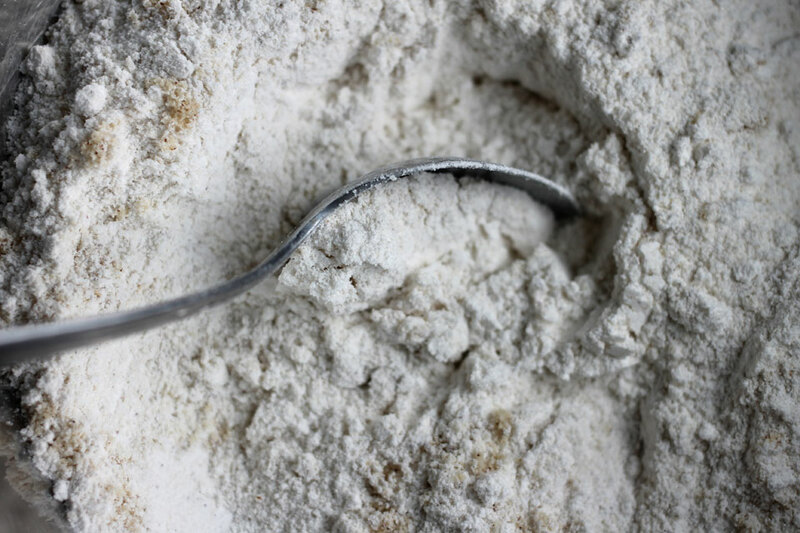 Sift almond meal and powdered sugar together and set aside. 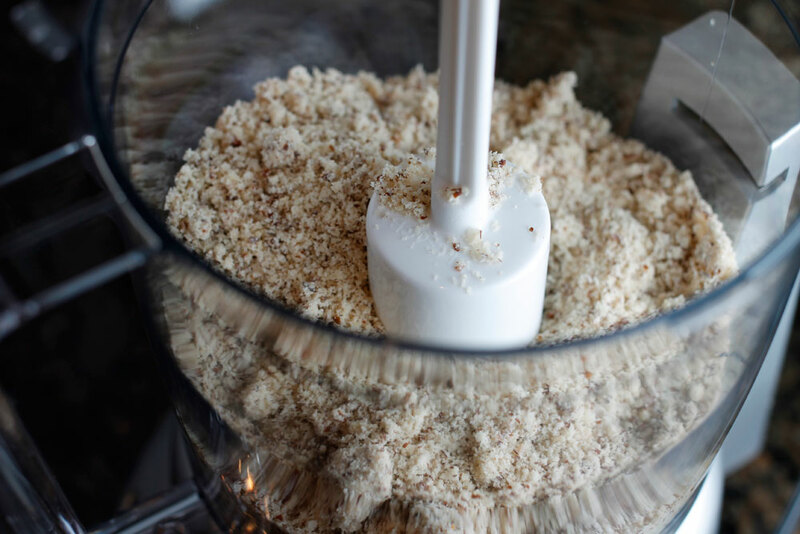 If the almond meal isn’t fine enough, grind it in a food processor until it’s fine enough for most of the meal to be sifted. 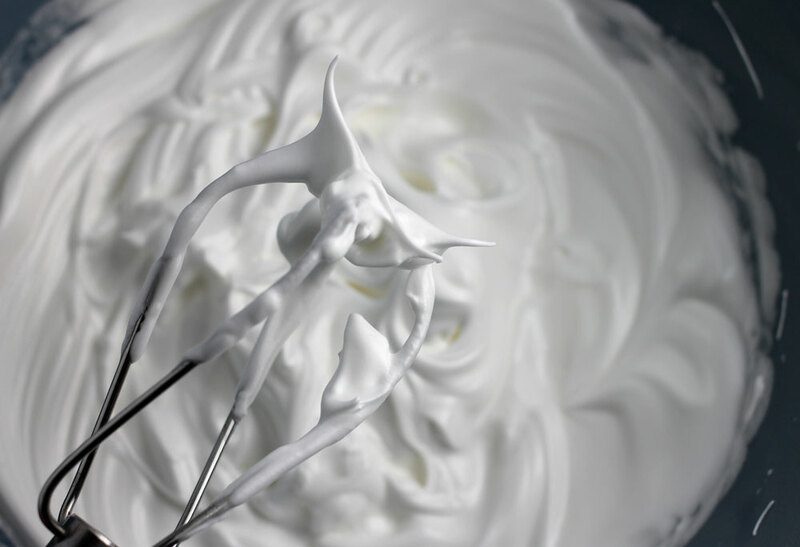 Whisk egg whites with a hand mixer until they’re foamy. Add the pinch of cream of tartar and continue beating until soft peaks form. Reduce speed and gradually add extra fine sugar. Increase speed and beat the eggs until stiff peaks form (this took me 7-10 minutes). Add the almond meal and powdered sugar to the stiff egg whites. If coloring the batter, place a bit of gel food coloring on the end of your rubber spatula before you begin folding the mixture with it. 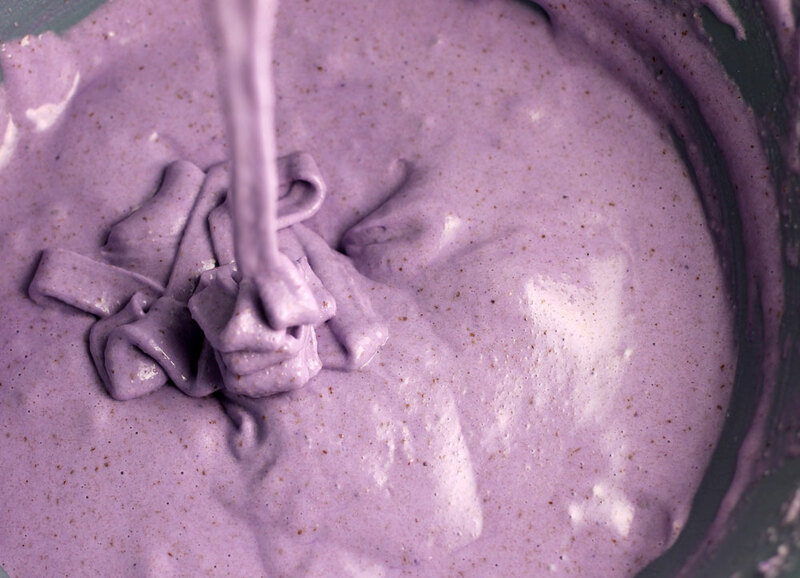 Liquid drops of food coloring might change the texture of the batter, so it’s not recommended. Fold the mixture with a rubber spatula using short strokes at first. The batter will be very stiff. Use bigger folds once batter loosens. When batter is ready, it should fall from the spatula in a thick ribbon. Transfer the mixture to a piping bag. Pipe 1 or 1 1/2 inch rounds on the parchment lined baking sheets. 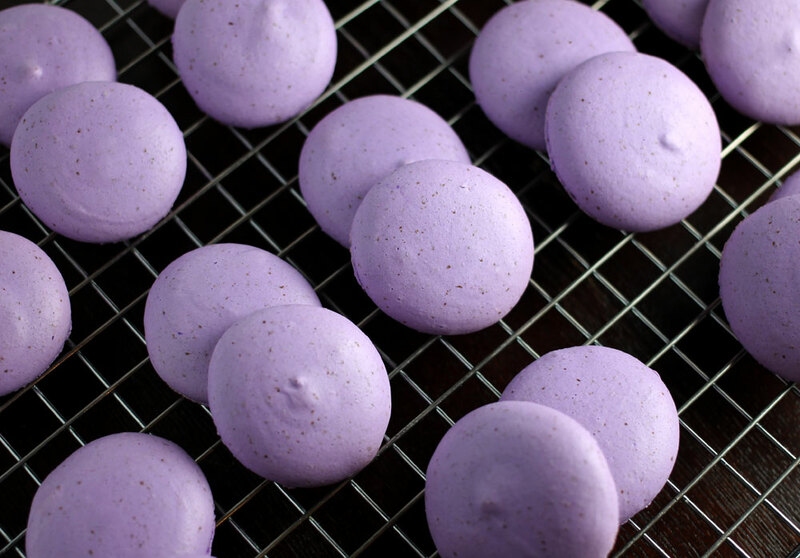 Let piped macarons stand uncovered for 15 minutes to form a crust. Decrease oven temperature to 325 just before placing the fist baking sheet in the oven. Bake one baking sheet at a time for 10 minutes, turning halfway through. After first batch has baked, oven temp should be increased to 375 then decreased to 325 just before the 2nd baking sheet goes in. 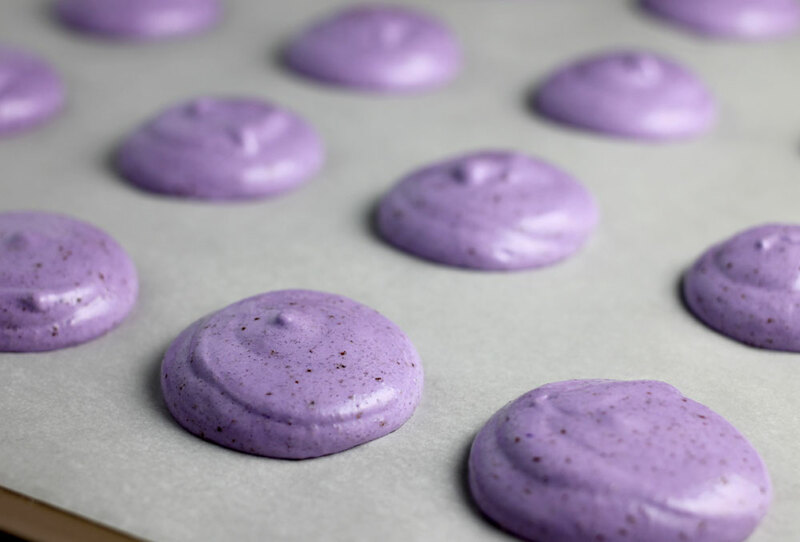 Let the macarons cool completely on the baking sheet. 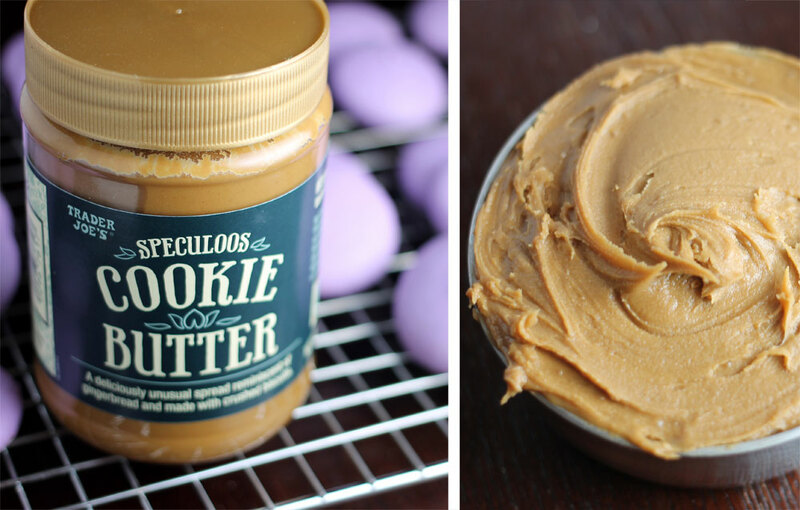 Once cooled, make your macaron sandwiches with your filling of choice – the cookie butter recipe below is great! Place the cookie butter, cream cheese and powdered sugar into a large bowl. Beat with an electric mixer until thoroughly combined. It’s ready to use!